It’s time to put those big ideas to work as Unilever is once again inviting young people to come up with practical and innovative solutions to some of the world’s biggest sustainability challenges and enter them in the Unilever Sustainable Living Young Entrepreneurs Awards (USL YEA). Open to anyone aged 30 or under, Unilever is looking for scalable and sustainable products, services or applications that reduce environmental impact, improve health, and well-being or enhance livelihoods, through changes in practices or behaviours. The Awards, in partnership with the Cambridge Institute for Sustainability Leadership (CISL), and in collaboration with Ashoka, will offer seven young people a total of more than PhP12 million in financial support and individually tailored mentoring. 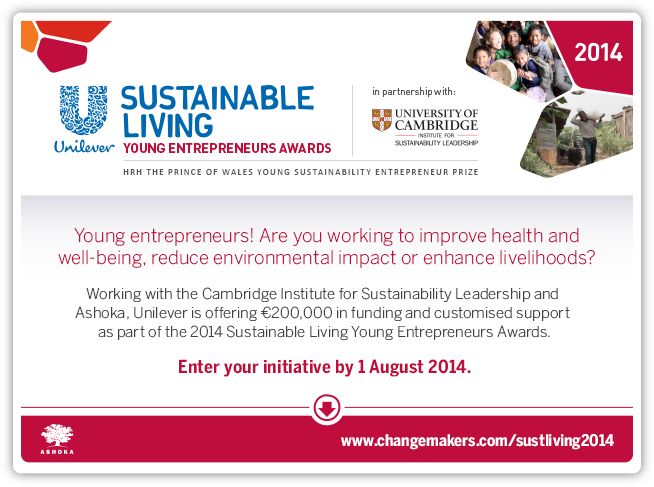 The overall winner will also receive the prestigious HRH The Prince of Wales Young Sustainability Entrepreneur Prize. All seven global finalists will also take part in an online development programme and a two-day accelerator workshop at Cambridge University, UK, where expert help and professional guidance will be provided, to help them develop their ideas. “The Philippines has a strong chance to win this award, especially since the Filipino youth are undoubtedly one of the most creative and optimistic citizens of the world. Coming from a country that has seen first hand the real impact of poverty to its people, a number of these young ones have become passionate enough to bring about change through social entrepreneurship,” said Unilever Philippines Chairman and CEO Rohit Jawa. The USL YEA is hosted online at Ashoka Changemakers, a community that connects social entrepreneurs around the globe to share ideas, inspire, and mentor each other, at www.changemakers.com/sustliving2014. Applications are now open, and must be submitted by the closing date of 12 midnight on August 1, 2014. Finalists will be announced late October 2014, with the Cambridge accelerator workshop and final judging in January 2015. Last year, over 500 young entrepreneurs from more than 90 countries entered the Awards. Winning projects included: a mobile data and messaging system that tracks water supply and optimized use (India), low-cost chicken-feed made from waste mango seed (Nigeria), water-less toilets in rural areas (Peru), and a work-for-education swap scheme where the children of low-income farm workers received education in return for their parents donating their labour to a farming collective (Nepal). The overall winner—who won €50,000 (almost PhP 3M) and the HRH The Prince of Wales Prize—was Gamal Albinsaid, a 24 year old Indonesian, who addressed two sustainability challenges with one idea: converting the value in household waste into health insurance for low income families. This inspiring initiative is now being turned into a repeatable model in communities throughout Indonesia.